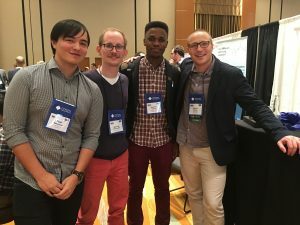 I had a wonderful time at the 35th International Modal Analysis Conference, held in Orange County, CA, from Jan. 30 to Feb. 2. 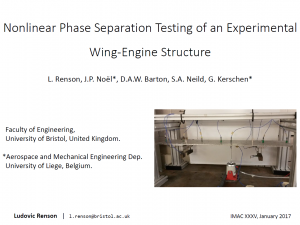 I had the opportunity to present my work on a nonlinear phase separation technique and its experimental demonstration (slides available upon request). From left to right – Tilan Dossogne (Liege), Edouard Verstraelen (Liege), Samson Cooper (Bristol), and me. I also had the pleasure to catch up with some of my former colleagues from the University of Liege.